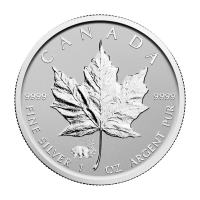 ظهر العملة ورقة قيقب مع علامة خاصة من الباندا اضافة الى فروع الخيزران وعبارة "Canada 9999 Fine Silver 1 oz Argent Pur"
ورقة قيقب مع علامة خاصة من الباندا اضافة الى فروع الخيزران وعبارة "Canada 9999 Fine Silver 1 oz Argent Pur"
1oz 2017 Canadian Maple Leaf Panda Privy Reverse Proof Silver Coin Buy this beautiful 1 oz silver maple leaf coin that features a privy mark of a panda bear, second in a series of reverse proof silver maple leaf coins that pays tribute to the popular Chinese Panda coins. The reverse displays a panda privy mark below the maple leaf which has been engraved using multiple finishes. The bear is standing beside bamboo, it's favourite food. These coins are minted in a beautiful reverse proof style, with the field being frosted while the maple leaf, privy mark and lettering are shiny. This release will be limited to mintage of only 50000. These coins will always be in demand thanks to their limited mintage, and will prove to be a highly liquid inflation hedge.